Two Garver employees recently graduated from the Emerging Leaders program, sponsored by the American Council of Engineering Companies of Arkansas and the Arkansas Society of Professional Engineers. Construction Services Team Leader Blake Martin and Aviation Project Manager Adam Roberson attended sessions and classes to further develop their leadership and professional skills. Topics included conflict resolution, public speaking, and contracts and risk reduction. This is the program's fourth year, and five students were involved in the program, which helps engineers stay fresh on some skills that can easily be overlooked and sometimes neglected in the profession. Blake and Adam were Garver’s fifth and sixth engineers to complete the program over the last four years. 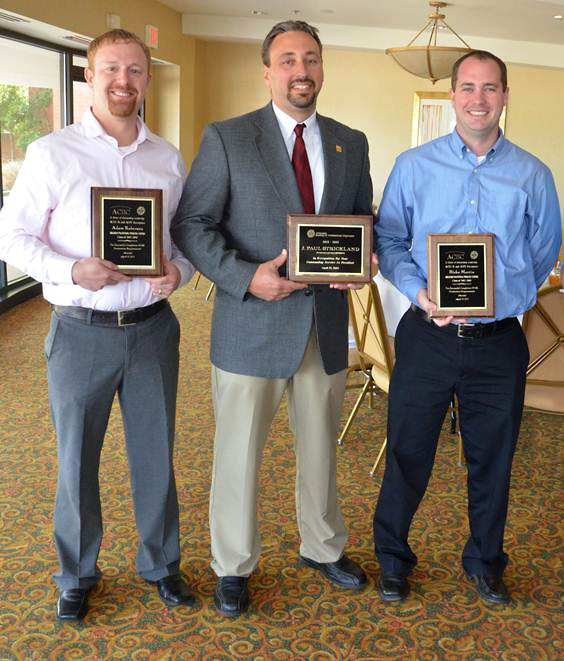 Blake and Adam were recognized for completing the program at the ASPE Annual State Conference by Garver Water Team Leader Paul Strickland, who served as 2012-13 president of the ASPE.